This is a guest post by tournament director Chris Schaffner. There are a number of advantages in using the innovative Swissdraw format compared to the more common pool format. All teams can potentially play each other. The Swissdraw format is designed so that teams of similar strength match up quickly and within a few rounds, the ranking of the teams represents their level of play. This guarantees attractive games against different opponents of comparable strength. While I am personally a big fan of the Swissdraw format, I will argue that the currently used system to rank teams has the problem that teams are awarded the same amount of Swiss points for a certain point differential, independent of the strength of the opponent. This drawback has particularly bad consequences in big divisions with a widespread level of play, where in later rounds of Swiss draw, teams can still make big jumps in the ranking by winning/losing by big margins. In this post, I would like to suggest another method of ranking the teams which will make the Swissdraw format work even better. This method has been suggested already back in 1976 by Leake in the context of ranking American college football teams. A nice mathematical explanation of it can be found in Chapter 4 of Ken Massey's undergrad thesis. If there are more teams with many games played among them, it will become more difficult to assign strengths to the teams, but we can nevertheless try to optimize these numbers so that they fit the outcomes as well as possible. In fact, this problem is well-studied in the area of mathematical regression. where y is a column vector containing all game margins, the rows of the matrix X are all-zero except for a +1 in column i and a −1 in column j. The column vector β denotes the strength of the teams and ϵ is the column vector of the error terms with normal distribution. Let us consider a simple example based on a made-up tournament with six teams. The game outcomes reflect the imaginary fact that their level of play is about evenly spread out among the top three teams and the bottom three teams where Team Alice is the best and Team Fred the worst team. PowerRank denotes the team's rank according to their strength, whereas SwissRank is the team's rank according to the amount of Swiss points earned so far. All game outcomes can be perfectly explained with those strengths. After the first round (and assuming no prior knowledge of the strength of these teams), it is impossible to compare Team Alice with Team Bob, because there is no connection between them yet. Notice that Team Charlie would be ranked first if sorted according to swiss points, as it had the largest marginal of +5 in the second round among the winners of the first round. Analogously, Team Danny would be ranked last. However, the new method re-evaluates all previous games from the point of view of the latest results, with the (correct) outcome that assigning the biggest strength to Alice gives the best explanation of the results. In fact, the power ranks after only two rounds already reflect the order of teams we had in mind when making up the results. The seventh column (entitled "predicted margin") is the difference in current strength of the teams involved in a particular game which can be interpreted as the margin predicted by the strength. The values in the last columns are the squared differences of the actually observed and predicted margins. If such a value is high, the model could not predict this game outcome well. Hence, big values stand for surprising game outcomes. The least-square procedure tries to find strength values that minimize the sum of the surprise values in the last column. By now the teams are clearly separated in strength. 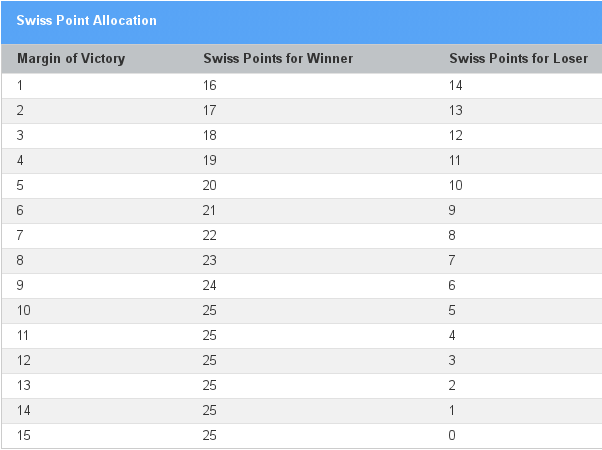 However, notice that the Swiss points still do not reflect the strengths of the teams correctly. Sorting according to number of wins as first criterion (and Swiss points as second) would put Alice on first place (she is the only one with three wins), but it would still place Team Eve ahead of Team Danny (both have one win and two losses). Let us examine the example graphically in the following chart. Clicking on series in the legend will toggle its visibility. Clicking on particular points in the chart will show detailed explanations how that strength was obtained. Here are the final evaluations of the games, based on the team's strength after Round 3, sorted by the upset/surprise value. The first line can be read as follows: based on the strengths computed based on all game results, the biggest surprise of all games happened in the round-2 game, where Team Charlie won against Team Danny with a margin of +5 where the model predicted a margin of only +3.73. Equipped with all this knowledge you can dive into the power scores for Windmill Windup and Wisconsin Swiss provided in the Further Analysis section at the end. There exist a wide variety of sports ranking systems. Most of these systems do not reveal the details of their algorithms. The power-rating system presented here is a very basic variant that I suggest to use for ranking teams e.g. in the Swissdraw phase of an ultimate tournament. As outlined in Chapter 4 of Massey's thesis, the system could be extended in various ways to account for things like home-field advantage, blow-out scores etc. As illustrated in the example above, it converges faster to the real ranking of the teams. Your strength depends on the performance of your opponents. A large win against a strong opponent counts more than against a weak one. Converges faster to the "real" ranking, smaller jumps in rankings from one round to the next. Games of previous rounds are "re-evaluated", you never have a certain amount of points for sure. Your strength depends on the performance of your opponents. I think that the first concern can be mitigated by providing interactive graphs like the ones above to help the teams explaining how their strength was computed. The other two disadvantages are inherent to the system. I am very curious to hear what you think about the suggested power-ratings in Ultimate. Do you see more advantages and disadvantages? Please leave your comments below. Leake, R. J. (1976), "A Method for Ranking Teams with an Application to 1974 College Football," Management Science in Sports, North Holland. Christian Schaffner has been managing the Swissdraw schedule and scores since 2009 at Windmill Windup, Europe's largest grass tournament. Since then, he has been involved in promoting and advancing the Swissdraw format for Ultimate tournaments. In his everyday life, he is a researcher in quantum cryptology at the University of Amsterdam. Nice work and it's good to see multivariate regression analysis being applied. It may be the simplest and easiest to use of the "advanced", mathematically sophisticated ranking algorithms, but I wonder if there were other reasons why you chose this one over the others such as minimizing the absolute errors rather than the squared errors, maximum likelihood, etc. Hi Mike, thanks for your comment! The main reason was (as you say) that least squares seems to be the simplest and best studied of the methods. There are also a number of statistical reasons why it performs well (e.g. 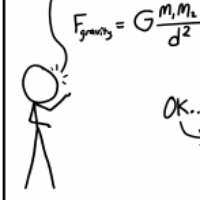 under some normality assumptions, least squares is actually the same as maximum likelihood). Of course, other methods have been suggested and might work as well, see e.g. a paper by Bassett (http://www.jstor.org/stable/2685396) for minimizing the absolute errors. Hi! I realize I'm six years too late to the party, but I played my first tournament under this system this weekend, so I thought I'd chip in in case someone is still monitoring the comment fields :-) There's a lot to say, but I'll keep it to two comments: First of all, I think it's very interesting and positive that people are starting to use statistical methods like this. There's a subtlety in that I think “classical” systems are trying to find the team that did the best (by setting up points as prizes) and a statistical system tries to find the best team—both are fine, they're just different, and which one you prefer is a matter of taste. Teaching people exactly what's going on is a challenge, but OK, most people won't be understanding tiebreaks in regular systems either (and in this one, they nearly never happen). However, I do find the underlying normality assumption too simplistic. (I also question the independence in a tournament where fatigue plays in, but it's probably harder to do anything about.) Goals in ultimate are probably a result of some kind of Poisson process (at least that's a somewhat more solid approximation), which doesn't map well to the Gaussian distribution when there are few goals, e.g. one team only manages to score 2. Especially when there are lopsided team strengths and/or results, the transitivity-of-goodness assumption also breaks down, and in particular, the system gets too sensitive to outliers—in extreme cases, you could even be asked to get impossible spreads in order not to lose score. (An interesting side note here is that if you're playing a statistical system, where win or loss doesn't really matter, you should allow draws!) I don't have a definite answer here, and you'd certainly get a model that's even harder for people to understand, but I'd love to see something with more explicit statistical modelling, ie., set up some sort of distribution for each match and maximize the total likelihood. You no longer get the nice closed-form expression, so you'd have to go for some sort of hill-climbing (or minorize-maximization), but the functions tend to be free from local minima and converge really quickly even with thousands of teams involved. Thanks!